Starbucks recently lost a lawsuit over a dark roast coffee line, known as Charbucks, sold by a small New Hampshire coffee roaster. 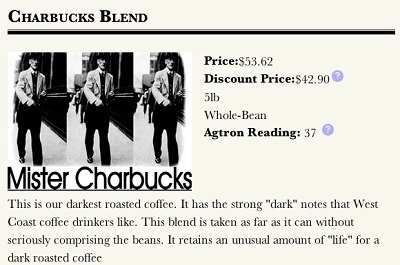 The Charbucks line of products essentially parody some of Starbucks more popular blends and are described (rather sarcastically) as containing “strong ‘dark’ notes that West Coast coffee drinkers like.” The East coast market has been traditional dominated by very light and medium roast coffees, a fact that is supported by the popularity of “blond” and other light roast brews out there, and the popularity of Starbucks makes it a frequent choice for just about any coffee-related jokes. The courts said that Charbucks products – and Charbucks is not the name of the roaster, just of some of their coffees – would not be confused with actual Starbucks products. A phone survey that was used as evidence in the case found that “the number one association of the name ‘Charbucks’ in the minds of consumers is with the brand ‘Starbucks'” and that 39.5 percent of participants thought of “Starbucks” or “coffee” when they heard the word “Charbucks.” But the survey also found that less than 5% of people surveyed would expect to find a Charbucks product in a Starbucks location – a fact that the court used to support its ruling that consumers would most likely not confuse Charbucks packaged coffee with any product sold at a Starbucks store.